Beautifully soft orange flavoured cupcakes for Easter or any other occasion, topped with a light and fluffy buttercream. Oh, and finished with mini caramel filled Easter egg chocolate cups. Sounds pretty irresistible, doesn’t it? I like to think of this recipe as a rather naughty treat, but not to the point of ridiculous. 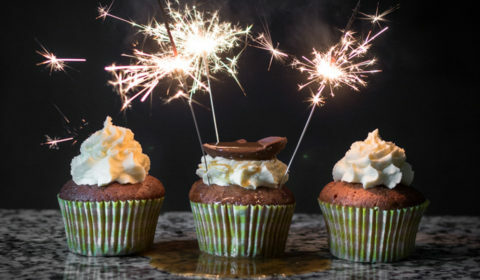 These are just well-made cupcakes with a little extra added to them. 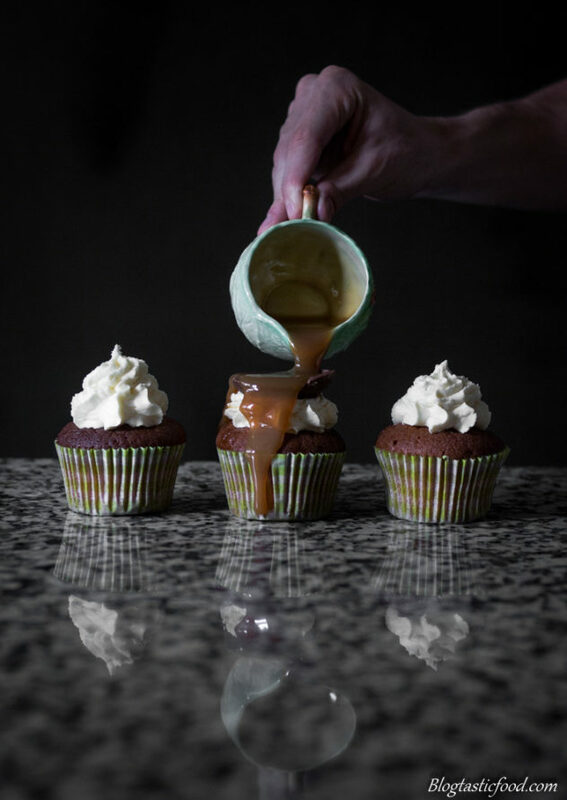 Serve these cupcakes and get everyone pumped as you pour the caramel sauce in the chocolate cups. You know that exciting moment when you bust the yolk of a poached egg, then you see the soft yolk come out? Well, this is the kind of exciting moment I am attempting to create with this recipe, but instead with caramel and chocolate. Before we get ahead of ourselves, we need to make the cake. Now, there are a couple of subtle changes, or to better put it, extra steps I like to take whenever I make the cake batter. And they are, beating the butter by itself before I add the sugar. And also, beating the eggs together first before adding them to the creamed butter and sugar. If you would like to know why I do this, you can read more about it in this Salted Caramel and Baileys Frosting Cake recipe. 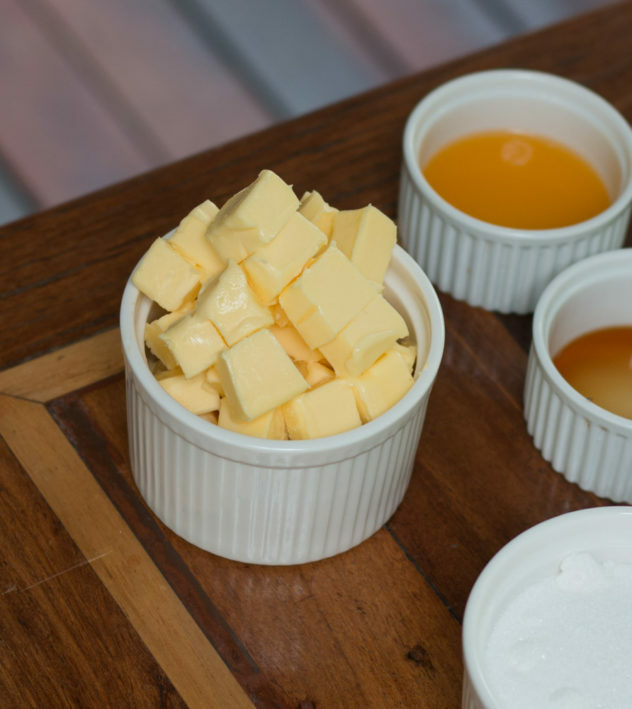 Wait for the cake to cool before you add the frosting – Don’t forget that buttercream’s main ingredient is…..well, butter. And butter melts quite easily as I am sure you know. Don’t let your beautiful frosting melt by piping or adding the buttercream on the cake straight away. 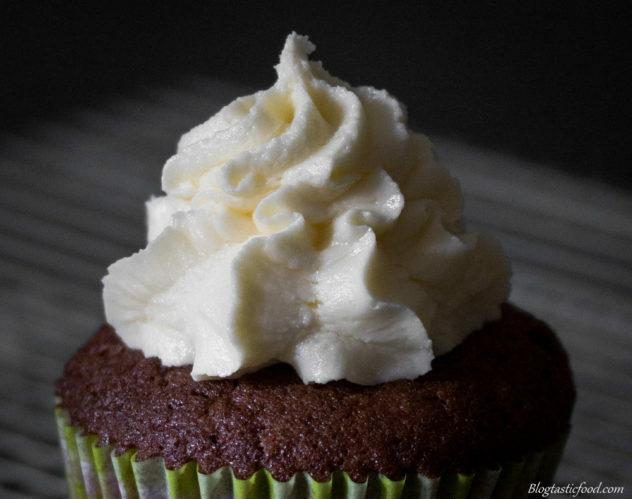 If it’s a hot day, you can put the frosting in the fridge for a few minutes – If the frosting starts to feel a bit too loose, that simply means that the butter is heating up. So you can cool it down in the fridge, but don’t refrigerate it for too long because the buttercream will then be too solidified. 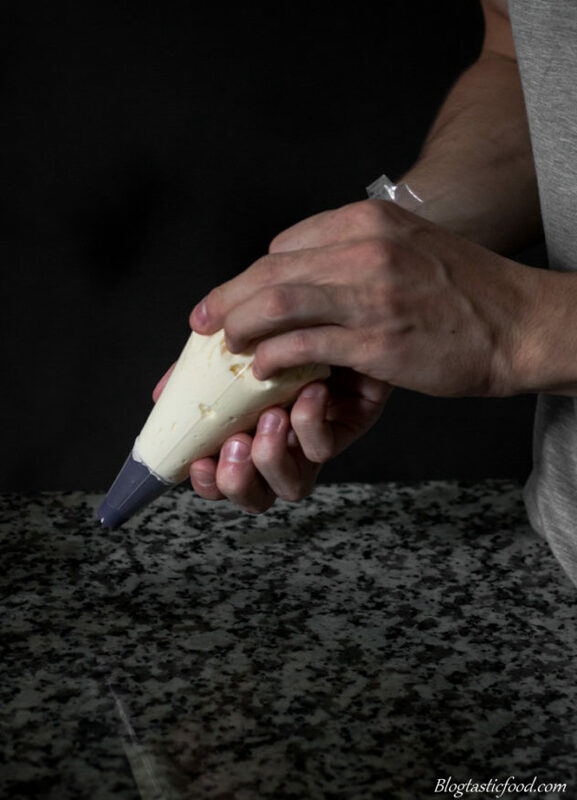 Bringing your butter to room temperature – Trying to beat stone cold, hard butter can be an absolute nightmare. And although the best case scenario is to wait for the butter to heat up by simply leaving it out of the fridge. You could also use the microwave, but be careful, I recommend 5-second bursts at a time, we are just trying to soften the butter, not melt it. Now, if you can’t be bothered piping, that is absolutely fine, you can just spoon the buttercream over the top. However, if you want to know how to make your buttercream look really good on your cake, it actually isn’t all that difficult. So, we have our piping bag with our nozzle (I like the star nozzle). 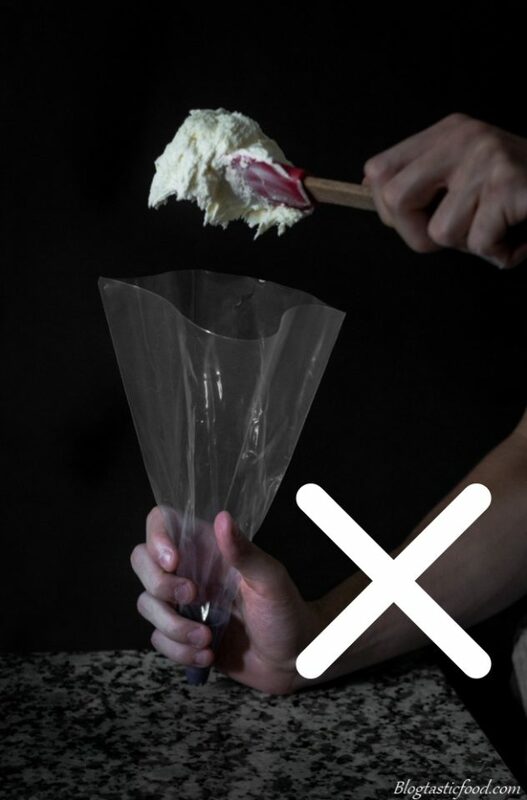 When you fill your piping bag with the buttercream, don’t just open the top of the piping bag and start shoving the buttercream inside. 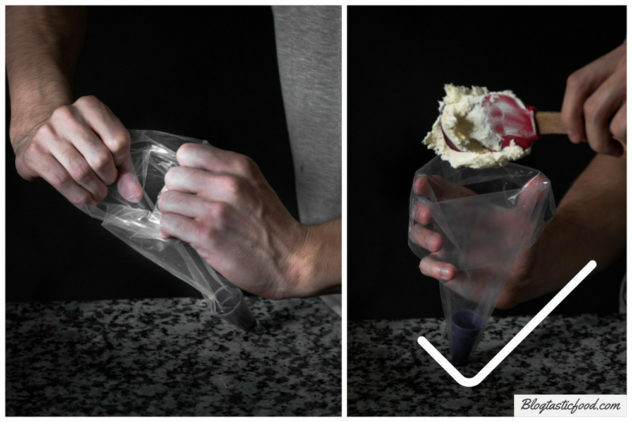 Instead, fold those edges over first, then you can fill the piping bag without making a mess. 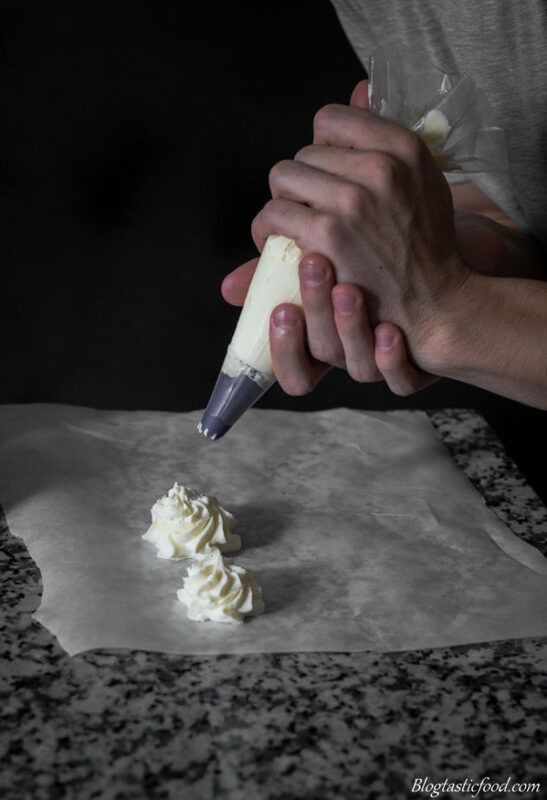 Once your piping bag is filled, I like to seal the buttercream inside by twisting the piping bag to make sure the frosting doesn’t come out the top. Now, I am no expert, but I do know a thing or 2 about basic piping. And the biggest mistake I see when people pipe, is the try to do these huge circles around their cakes or cupcakes. Which is completely unnecessary. Before we get to the technique, I’ll go over one quick tip. 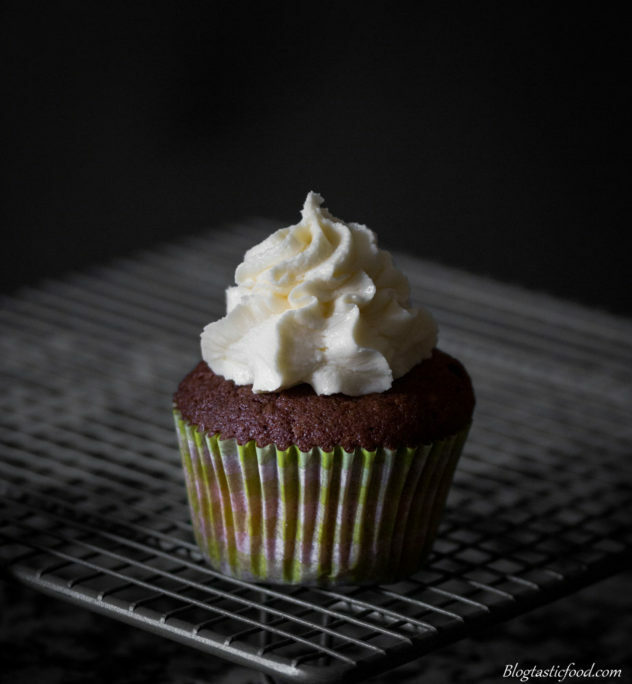 If you want to practice your piping skills, try practising on a sheet of baking first, then when you’re comfortable with your technique, you can re-fill your piping bag, and go to town on your cupcakes. Now, the piping technique. 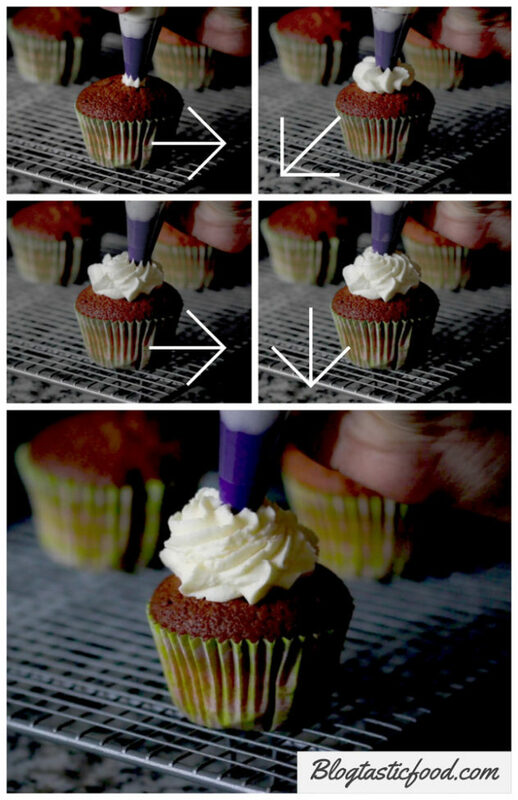 First, make sure your piping bag and nozzle are vertically over the cupcake, do not pipe from an angle. And rather than starting on the outside of the cupcake, making huge circles, I start piping in the middle of the cupcake. No circle motions yet, just squeeze a nice dollop of buttercream on your cupcake, then you can make a couple of GENTLE circle motions. Finally, release the pressure before you pull the piping away. Otherwise, you may end up with a big log of buttercream down the side of your cupcake, and you’ll have to start again. I hope these tips helped you, and I hope you have an incredible Easter my friends!! Thank you so much for the time you spent on the post. If you want to subscribe to stay updated for new recipe posts, feel more than free to do so. Happy baking! A super naughty treat for Easter. Beautifully baked cupcakes with buttercream and caramel filled Easter eggs on top to finish it all off. Pre-heat your oven to 160 degrees Celsius (325 degrees F). Beat your eggs and the egg yolk in a bowl or measuring jug. Get a muffin tray, and fill 10 muffin moulds with a muffin case. Beat the butter in a large mixing bowl until pale, then add your sugar. Beat the butter and the sugar together until light and fluffy, and until the mixture increases in volume a little bit. Add the beaten egg bit by bit, beating through well after each addition. Next, add your orange juice and your vanilla extract then beat through one last time. Sift in your self-raising flour and a pinch of salt, then use a wooden spoon or spatula to gently fold the dry ingredients through. Fill your muffin cases with your cake batter a little more than 3 quarters of the way up. Then, bake in the oven for 1 hour. Test to see if the cupcakes are cooked by sticking a skewer through the middle of one, leaving it for 2 seconds and pulling it out. 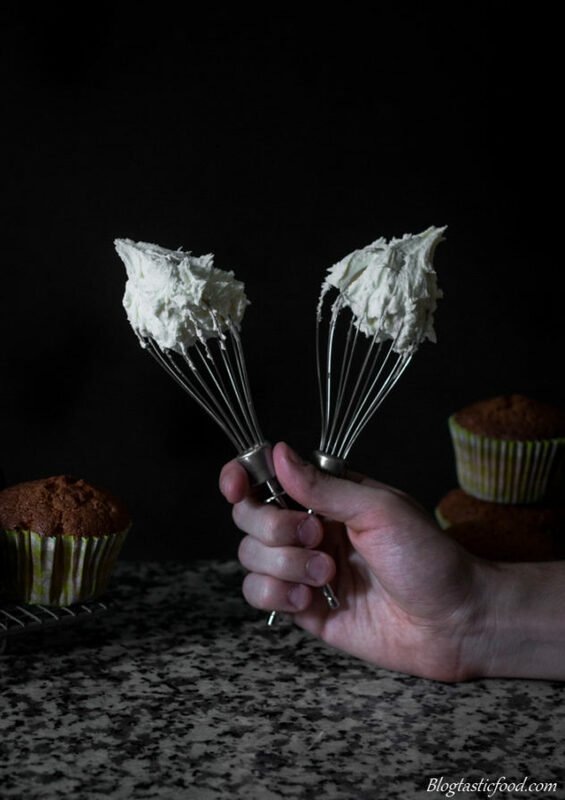 If the skewer is clean, then your cupcakes are cooked. Transfer the skewers onto a cooling rack and set aside. Beat the butter in a large bowl for about 5 minutes until nice and pale, increased in volume and has a really nice cream like texture. Add your sifted icing sugar bit by bit, beating through well after each addition. 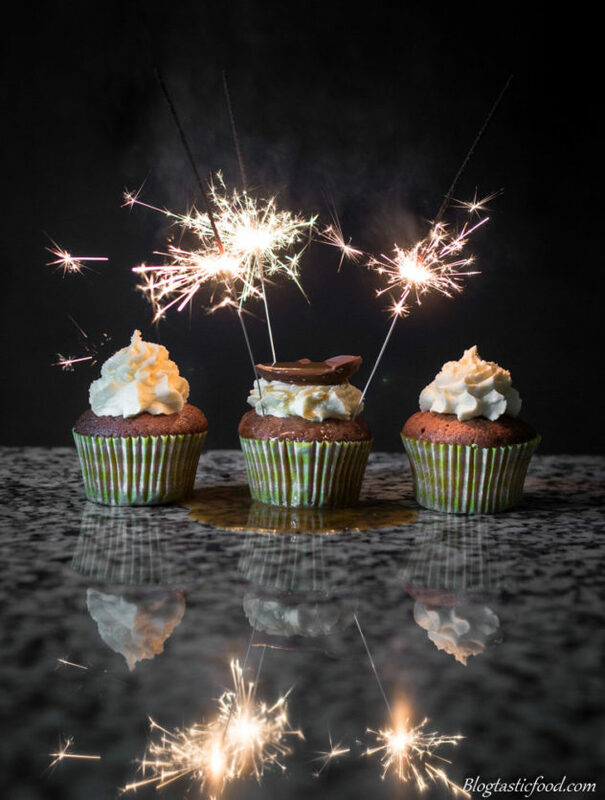 Once the cupcakes have cooled down, you can spoon the buttercream over the top, or you can fill a piping bag with a star nozzle and pipe the frosting on top. When you've frosted all of your cupcakes, put your halved chocolate Easter eggs on top to make them like little mini cups. Finally, pour the caramel sauce inside the chocolate cups and serve. Wait for the cake to cool before you add the frosting. If it's a hot day and the buttercream feels too loose, put it in the fridge for a few minutes. If you didn't leave the butter out of the fridge in advance for it to come to room temperature, you can pulse it in the microwave 5 seconds at a time until it's softened. Make sure it doesn't melt. Wow! What a showstopper! I’m getting ready to make chocolate-mint cupcakes for my daughter’s birthday. Maybe I can convince her to have these instead! Thank you so much Rebecca!! I hope she likes them if she has them!! You had me at caramel and chocolate! 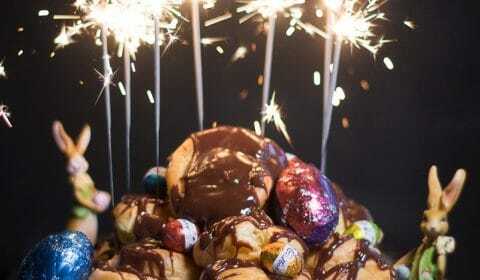 This are perfect for Easter, delicious and easy! Thank you for a quick perfect treat! These are cute and a super Kitty party option. I am drooling. Omgggg 🤩 This looks absolutely amazing. I love everything about this. I’m such a sucker for caramel. Thanks for this amazing recipe! I may actually be drooling on my keyboard right now. Oh and thanks for the piping tips, I could do with improving my skills. No worries Cath! Thank you for your amazing comment!